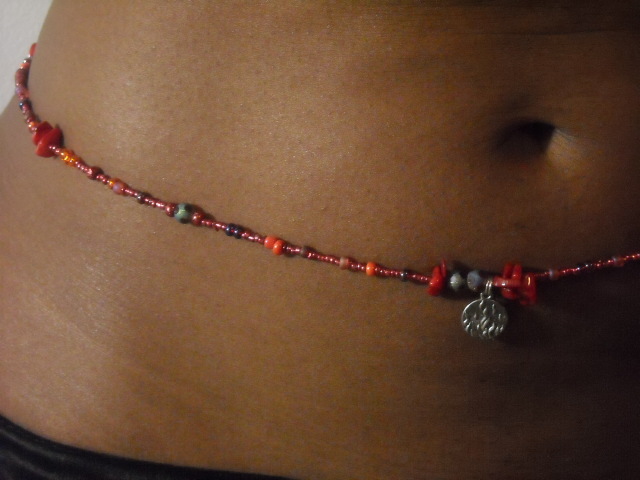 If you think waistbeads are for ladies only, think again. Although I have created waistbeads for a man – I’ll get to that in a minute – please consider that the waistbeads your woman wears is as much for your pleasure as it is for hers. In a sense they are the perfect gift – they are beautiful, spiritual, cultural and lovingly reciprocal. When she wears waistbeads for herself, she’s giving you a gift; when she wears waistbeads for you, she’s giving a gift to herself. 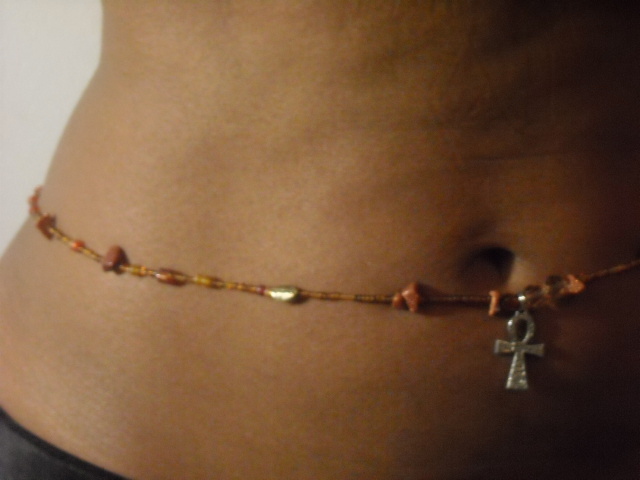 And while the same can be said for other types of jewelry, few have the same sensual appeal as waistbeads. 1) They make your woman FEEL more beautiful as the energy the gemstones exudes a subtle positive influence. 2) They make your woman LOOK more beautiful; waistbeads are stunningly seductive along the curves of her body, against the glow of her skin. 3) Gemstone waistbeads add to her spiritual armor, protecting her and keeping her safe from negativity when you are not around. And if she is pregnant, her waistbeads are literally guarding your family. 4) They are a part of your racial memory. The oldest African jewelry ever discovered was found in 2004, in the Blombos cave on the southern tip of South Africa. 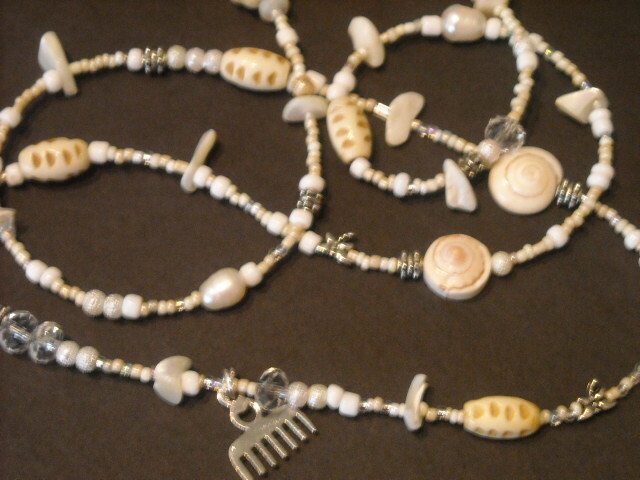 They are 40 mollusc shell beads that had been pierced and are estimated over 75,000 years old. 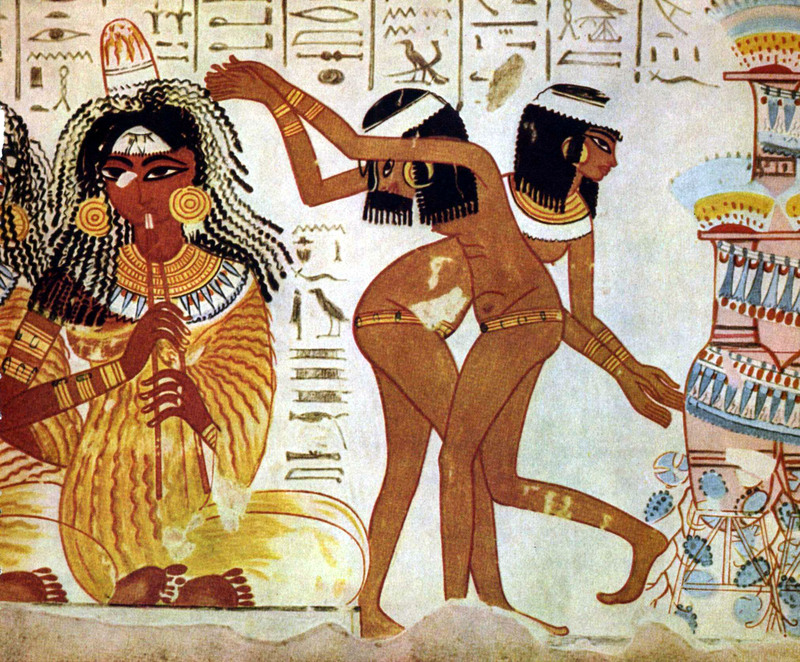 Women are seen wearing waistbeads on the walls of the pyramids in Egypt, but it’s hard to say when they were first introduced into our culture. However, it’s certain they have always played a large role in seduction and romance between the sexes. In her book, “Sacred Woman,” Queen Afua writes among the 17th century Saramaka people, a woman would give her scented waistbeads to her husband as a symbol of her intended fidelity when he went away for long periods of time. That certainly beats a photo on your cellphone! 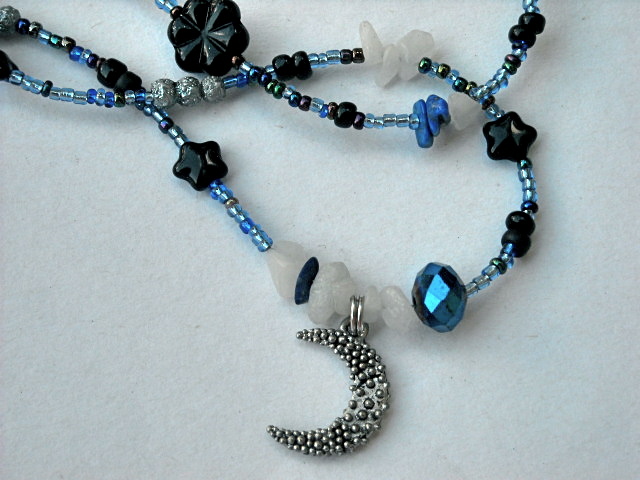 5) From a dozen years experience in this craft, I kid you not when I say there are few women who would not be moved when a man selects and purchases a set of waistbeads for her. It is more creative than flowers, sexier than lingerie, and more personal than most other jewelry. As you can see the benefits are multiple. 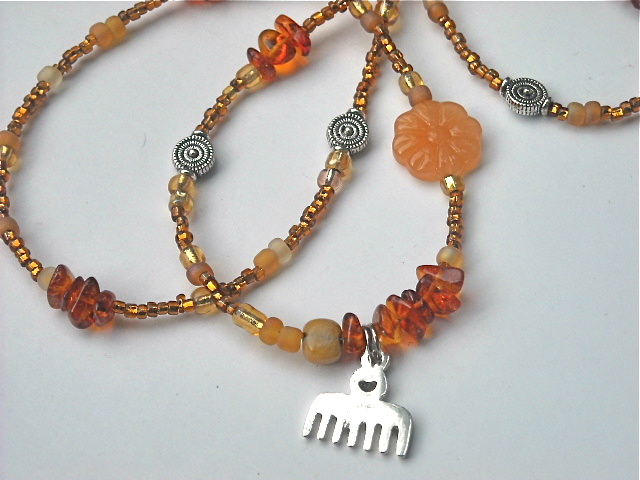 For superior quality and beauty, try Wrap and Soul gemstone waistbeads. For those of you who are wondering whether a man can wear waistbeads – yes, I do get asked that question – the answer is: It depends. I was once talked into making waistbeads for a very persistent older brother. 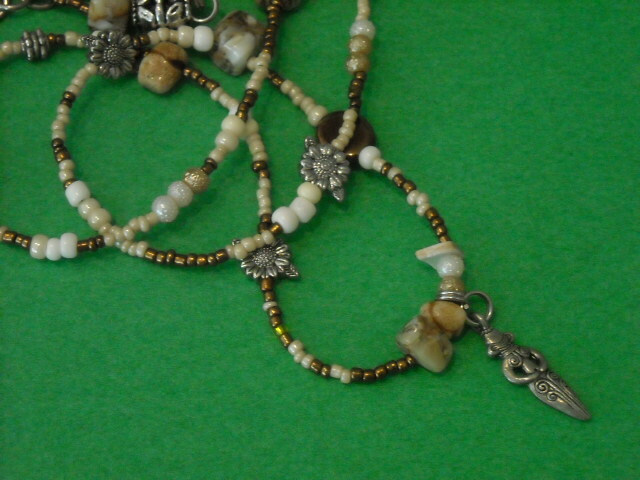 He selected the beads and stones, the symbols, gave me his measurements and drew up the design. 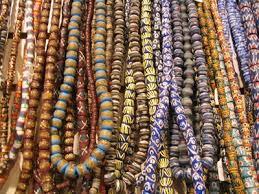 I knew that some African men do wear beads and belts around their waists, so the concept was not completely strange to me. But, as I pointed out to him, those men wore little or no clothing at all. The idea of waistbeads UNDER modern pants or jeans, seemed a little odd. Nevertheless I made them, presented them to him and he was thrilled. A month later I met him on the street with his waistbeads on – around his neck! When I commented on his “necklace,” he looked at me rather sheepishly. “As waistbeads, they just kept getting in the way,” he said. Rose quartz is the crystal of love and romance, and not just because of its pretty, pale pink color which is associated with calm, beauty and feminine energies. 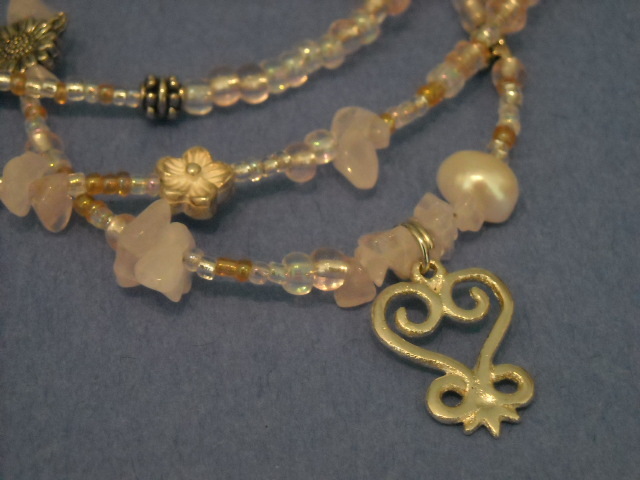 Rose quartz stimulates the heart chakra from which all human emotion flows, the center health and wellness. When the heart chakra is properly balanced, you will experience peace, focus, kindliness and compassion for others. Rose quartz, a clear translucent stone, is best known for its ability to improve self-love, attract love, and improve fidelity in marriage or existing relationships. In her book, “Sacred Woman.” Queen Afua recommends the use of rose quartz during rituals for sacred relationships, and she associates the stone with Maat, the Khemitan guardian of wisdom. In ancient lore, rose quartz was soaked in elixirs which women drank for a more youthful, beautiful appearance. It has been used in human adornment for over 4,000 years. Above all, it is the stone of universal love and forgiveness. Wearing Wrap and Soul rose quartz waistbeads is a wonderful way to infuse your aura with the energies of this powerful stone. Quartz is the second only to fieldspar in abundance within the earth’s crust. Rose quartz gets its distinctive color from traces of titanium, iron, or manganese. 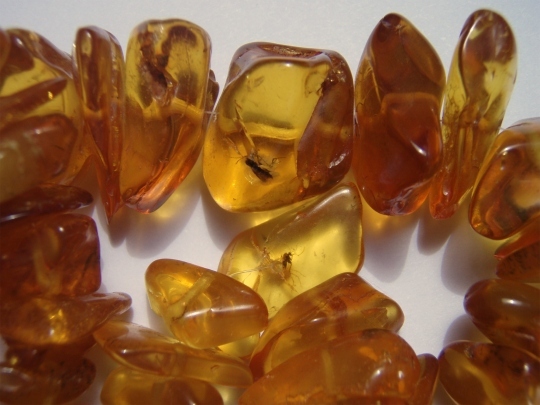 Other semi-precious quartz-based gemstones include amethyst, citrine and smoky quartz. Rose quartz is found throughout the world, including the USA. But the best examples of this stone are found in Brazil. For more rose quartz waist beads go to Wrap and Soul.